Audi is set to present its next step in automotive lighting technology at the upcoming IAA in Frankfurt. The new Matrix OLED lights will enable a previously unattainable level of lighting homogeneity, opening up further creative opportunities for design, said a statement. As a leading brand in automotive lighting technology, Audi has systematically developed all aspects of OLED technology over the years. Matrix OLED lights will combine high‑tech engineering and design ideally – initial projects are currently underway to implement OLED technology in production tail lights. They will be shown for the first time in a concept car at the IAA, it said. In each OLED (organic light emitting diode) unit, two electrodes – of which at least one must be transparent – incorporate numerous thin layers of organic semiconductor materials. A low DC voltage – between three and four volts – will activate the layers, each of which is less than one‑thousandth of a millimeter thick, to light them. The colour will be based on the molecular composition of the light source. In contrast to point light sources – such as LEDs – which are made of semiconductor crystals, OLEDs are flat light sources. Their light attains a new level of homogeneity, and its dimming is continuously variable. The lights do not cast any shadows and do not require any reflectors, light guides or similar optical components – and this makes the OLED units efficient and lightweight. In addition, they hardly need any cooling. 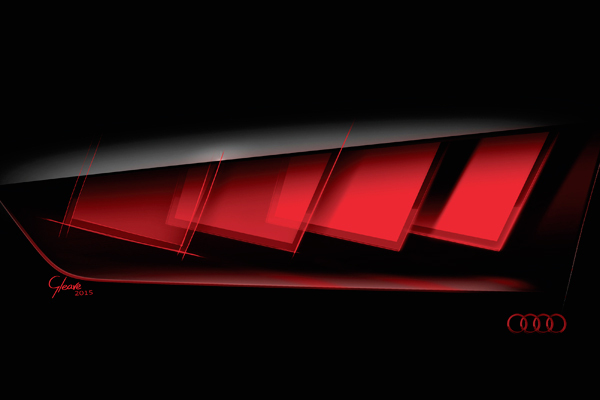 Progress in OLED technology is being made rapidly – in part due to the driving force of Audi. As soon as further increases in light density are realised, OLEDs will soon be able to generate turn signal and brake lights too. The thin glass sheets that are used today to encase the organic material will be replaced by plastic films. These new flexible substrate materials will lend themselves to three‑dimensional forming, and this will open up entirely new creative spaces for designers. Special highlights will be ‘OLED lighting’ with transparent, multi-coloured OLEDs in the silhouette of the car and ‘the swarm’ with a three-dimensional OLED display. Another benefit of OLEDs is that they can be subdivided into small segments that can be controlled at different brightness levels. In addition, different colours and transparent OLED units will be possible. This will enable new lighting scenarios with extremely fast switchover times.